Both moves were great! The three movers were very professional, organized, clean and friendly. Congratulations! It’s official. You’ve decided that it’s time to move. You know you need to find a reputable local moving company, begin sorting through your furniture and belongings, and start packing. But you may also be wondering exactly what size moving truck you’ll need and how that will affect the cost of your move. Sound familiar? In order to determine the truck size and number of trucks necessary for a client’s move, All Jersey Moving & Storage asks a series of questions specific to your move. Once we understand your unique moving needs and the scope of your move, we can provide you with a detailed moving quote. As a general rule, the type of truck necessary for small moves can be determined over the phone or via email communication by movers who know what exactly questions to ask. A “small move” constitutes moving the contents of a one bedroom apartment or less. To determine the type and number of moving trucks necessary for larger moves, an onsite visit is usually necessary. At an onsite visit, a professional moving company like All Jersey Moving and Storage will survey your rooms and storage areas to determine the scope of the move. They will then indicate the size and/or number of trucks needed to execute the move and provide a quote. Inexperienced or dishonest moving companies may provide a quote for a large-scale move over the phone, only to jack the prices up significantly on moving day. What’s worse, they may come with the wrong size moving truck only to determine it is too small for the job. That is why it is so important that you get a detailed quote, ideally following a site visit, in writing, which must be signed off on by both you and your movers before proceeding with the move. The most popular moving truck sizes are a 15' truck, 26' truck and 53' tractor trailer. Some variations of the smaller truck are 15-17' and 24-26', or a 48-53' trailer. How Many Trucks Can I Expect Will be Needed for My Move? All Jersey Moving & Storage often dispatches 26’ trucks. One 26' moving truck can hold the contents of a three bedroom home that is reasonably furnished. 15' moving vans are another popular truck size. They can hold the contents of a one bedroom apartment. Professional moving companies like All Jersey Moving & Storage use different truck configurations based on the size of move. However, it’s important to know that it is standard practice for moving companies to dispatch a couple of trucks to a standard four bedroom home. In that scenario, the second truck typically handles the garage, shed, outdoor items, exercise equipment, and miscellaneous items that are difficult to stack. Professional movers often use two or more trucks for large local moves opposed to a tractor trailer because it saves time. When companies can execute moves more efficiently and save time, they are able to offer clients more competitive pricing. Tractor trailers are difficult to maneuver through neighborhood streets. In some cases, doing so is simply not possible. Tractor trailers are generally only used for long distance moves or large moves with a short term storage requirement. Office moves and commercial moves are truck intensive, due to the types of furniture, electronic equipment, cubicals and plastic totes typically involved in these moves. For this reason, moving companies executing office/commercial moves are not able to utilize the space inside their trucks as well as on residential moves. For example, professional movers may be able to get 1400 cu' of residential furniture onto a 26' moving truck, but that number drops down to about 850 cu' when moving office furniture. There are two main reasons for this. First, office furniture does not stack as well. Second, the loading techniques used to expedite the transfer of office furniture reduce the amount of useable space. Items are often left on dollies to expedite office moves. Some people tell themselves that they will purge some of their large or clunky possessions and get rid of clutter and other unwanted items before moving day in order to reduce the amount of truck space necessary for their move. They assume this will result in a cheaper quote. While moving is certainly an opportunity to assess what you no longer want or need, it’s still important that you beware of being overly optimistic about how much “stuff” you will successfully get rid of before moving day. You don’t want your movers to arrive with a truck that is simply too small to carry your furniture and possessions. It is also worth noting that it is important to steer clear of moving companies who charge by the cubic foot. Movers who charge by the cubic foot take tend to advantage of the fact that people often forget about certain items when obtaining a quote and/or underestimate how much room they’ll need. Unscrupulous movers use this strategy to charge you much more because you went over the specified space allotment. One of the most critical steps of the moving process is ensuring that you are getting an accurate quote from an experienced mover. In fact, it is recommended that you get at least three quotes from reputable movers. Professional moving companies like All Jersey Moving & Storage ask many questions and often visit your residence or office to assess the scope of your move. All Jersey Moving & Storage is the most highly recommended company for moves in the New Jersey area and along the East Coast. We provide detailed moving quotes and stand by them, ensuring there are no “hidden surprises” at the end. Because our employees are fully trained and bonded, there is also a significantly lower chance of breakages and theft. Some people absolutely dread moving because they can’t stand packing, while others are so busy they simply don’t have the time for it. If the thought of packing up your home or office leaves your head spinning, or you have starting packing but don’t have sufficient time to finish, All Jersey Moving & Storage can step in on short notice. We offer surprisingly affordable packing and unpacking services. “Unpacking” Option 1: The basic unpacking service is a standard in our industry. Movers unpack your boxes and place the items on a flat surface, such as table tops, counters, beds, and floors. This service does not include placing or organizing your items in cabinets or on shelves. “Unpacking” Option 2: Our premium unpacking service will dedicate two or more employees to unpack all your boxes and set up your new home. Items will be unpacked into cabinets, placed on shelves, etc. This is a very popular service with seniors and working professionals who need to reduce the time and stress involved in the moving process. 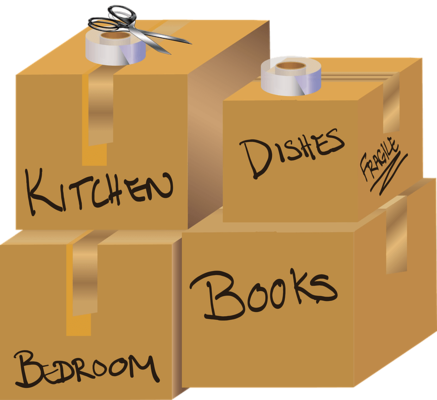 Use correctly sized boxes – avoid placing multiple heavy items in one box to save space. Pack heavy items at the bottom of a box and lighter items on top. Fill spaces with paper, foam peanuts/popcorn, towels or clothing. Remember that partially full boxes will sag when other boxes are stacked on top of them. There’s also less chance of shifting in the truck if boxes are solidly packed. Avoid the temptation of mixing items from different rooms just to fill boxes. Unless you have a detailed inventory and put a lot of information on the exterior of the box, you could spend a long time searching for something in the wrong box. Think outside the box. This means not loading pieces of furniture the way they’re normally used, but possibly stashing them vertically in your truck to make more room. You also don’t want to crush a couch by stacking heavy boxes on top of it if you’re keeping it horizontal. At the same time, you need to be extremely careful. You and your helpers could be seriously injured if a piece of furniture topples over. The resulting expenses would probably be higher than using a professional moving company in the first place. Use blankets and duvets as protective wrap rather than packing them away in a box. Leave clothing and linen inside dresser drawers. Use tape or rubber bands to ensure the drawers don’t slide open. Valuable or small loose items should be removed and packed separately. You’ve Underestimated Space – Now What? At All Jersey Moving & Storage, we have had clients who struggled to make quick decisions about what to keep versus what to part with during the packing process. This isn’t uncommon – after all, deciding what items to part with can be difficult, especially if they carry emotional attachments. Other clients make the mistake of underestimating the size of their new home or office space. They express concern and even go into full-fledged panic as they realize they have more possessions that they aren’t ready to part with or haven’t been able to sell or give away than they do space. These types of situations make the already stressful moving process even more daunting for many people. Of course, in an ideal world, we would all begin packing months in advance. This would give us the time necessary to sort through our possessions and determine what to bring along to our new home. It would also enable us the time necessary to donate or sell other items. But if you are planning a last minute move or simply left packing to the last minute, you may want to take advantage of containerized storage, at least as a short term solution. Putting some items in storage until you’ve made a decision or have more space is one solution many people choose to take advantage of. All Jersey Moving & Storage offers containerized storage in our own facility, carefully wrapping items in blankets and sealing and securing them in large wooden containers. Movement into and out of our storage facility is closely monitored to ensure the safety of your possessions. We also offer stable rental fees and no move-in administration costs, making storage a stress-free decision. Contact us now for a free no-obligation quote.